Hello everyone, I have released Alpha 0.3. 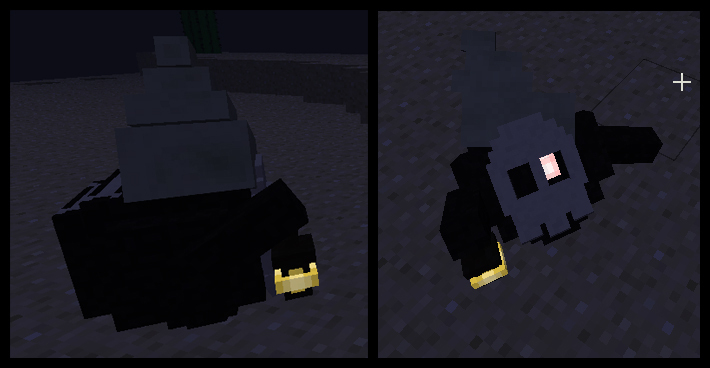 The new mobs I will confess, are a little shallow in terms of new gameplay. This update focused more on animation design and optimization. 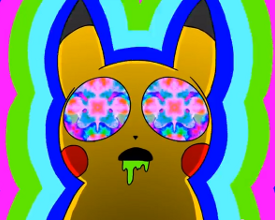 It is now super easy to add animations you see on Zombie Umbreon and such. Forcewind Eelektrik is definatley something to check out in Creative Mode. 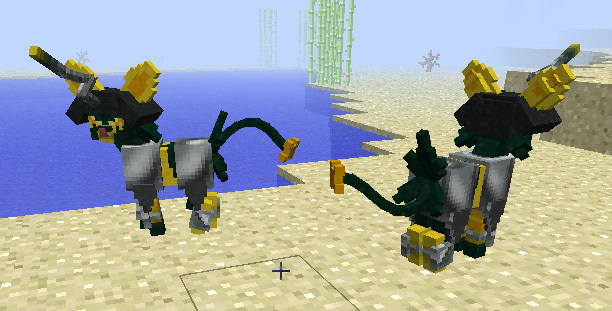 As for updating the mod to Minecraft 1.7.2, I see the Forge team is still working with their 1.7.2 version. I think I will keep working in 1.6.4 until they feel 1.7.2 is finished. As I said before, it was a mess when I tried it and I hope it is cleaned up by the time they move on. In celebration of X and Y, I was thinking Dark Glass Yvetal and Zombie Xerneas. I do not plan on working with Legendary Pokemon for a long time. I would rather be more comfortable with Entity coding be attempting something worthwhile. I am actually not sure how modpacks work. I might need an explaination and get back to you on that later. Ah, that mob is set aside for a special themed update, likely Alpha 1.0, when I update the mod to 1.7.2 whenever that might be. Might not necissarily be the next update. I am trying to keep with an update per month, but this next one might be pretty hard. I am still not sure what a modpack actually is or how it works to answer that. A modpack is a group of mods compiled together OR a group of mods with download links on the same page. If it is a group of mods, normally it needs some sort of modpack loader, but I'm getting ahead of myself now. For the update with the Ifrit Houndoom, I think it is a Halloween theme. Ah, ok. I am talking about it with someone. I have not decided yet how ok I am to modpacks. Though really, I cannot recommend this mod for multiplayer gameplay. I have no idea how to program for multiplayer. Yes, this is actual game footage from my mod. That tail animation is hypnotic. His last post on Deviant Art was a day ago, and he uploaded a screenshot on the 29th. So he's obviously active. Just... not here for some reason. The latest post also happened to be on April Fools, so I suppose whatever was said in it should be taken with a grain of salt. If he's serious, he chose a very bad day to post about it. I never post anything to be taken seriously on April Fools. It just isn't smart. Anyway he hasn't updated in forever, and I want new corrupted Pokemon!!! Anyway, if he don't continue with this mod, you betcha I am continuing it, maybe with some help though. I'm currently looking into buying a book to learn Java myself. Minecraft is like this big, giant awesome timeless sandbox and if you have the ability and know-how you can mold it into just about whatever you please. I hope to one day be able to do just that. We cannot rush the mod creator, be patient. I am still reluctant to work with the new Forge introduced for 1.7.2 and seeing they are still working on that version is not very inviting. I have been following Mojang's progress on 1.8. I am not that impressed to even think about updating to that anytime soon, even if Forge does get its act together quickly. Updating to a major version such as from 1.4,-1.5-1.6 has always been hell. c_c' I expect 1.7.2 to be worst with sound files, hearing the code was completely rewritten. Sound has always been a problem every update. I do have one concern I noticed in my Alpha 0.4 update. My game seems to lag a little on both my low spec laptop and my fairly powerful desktop. I have not pinned that down yet. My desktop is running a 4-5 year old graphics card though. It can't even handle "high" graphics on Starcraft II when I played Heart of the Swarm campaign. It just might be the card is old and needs replace and not that my mob animations are taxing. Alpha 0.4 features 8 new mobs: Armored Luxray, Armored Shinx, Clay Commander Liepard, Doomstone Glaceon, Swordie Mienshao, Verktora Mightyena, Voorst Mightyena, and Zealot Pawniard. The mod update itself is all ready to go. The delay is I am rewriting the main forum post in webcode to make updating it easier and building the feature pictures of all 22 mobs (new format). So after being endlessly late, I finally released Alpha 0.4. I hope you all enjoy it. ^^ I tried very hard to make everything was correct and not too terribly buggy. I will try and plan out what I want to do for Alpha 1.0, the update to 1.7.2. I am torn between two themes, each a tribute to favorite Let's Players on YouTube. These themes have been planned for Alpha 1.0 and 2.0 for months now. School has been brutal to me already for Summer classes. I will see when I can find inspiration to work on the mod. But in the mean time, enjoy! PS: I love your models! The regular Zergling and Raptor Zergling look very similar but they have some notable differences. The regular occasionally transforms into a Baneling whereas the Raptor is fast and farther/higher jump. The Raptor Zergling is capable of clearing smaller mobs in front of it, just like the Raptor Strain Zergling in Starcraft II: Heart of the Swarm. As you might guess, the Baneling Nincada is a kamikaze unit. 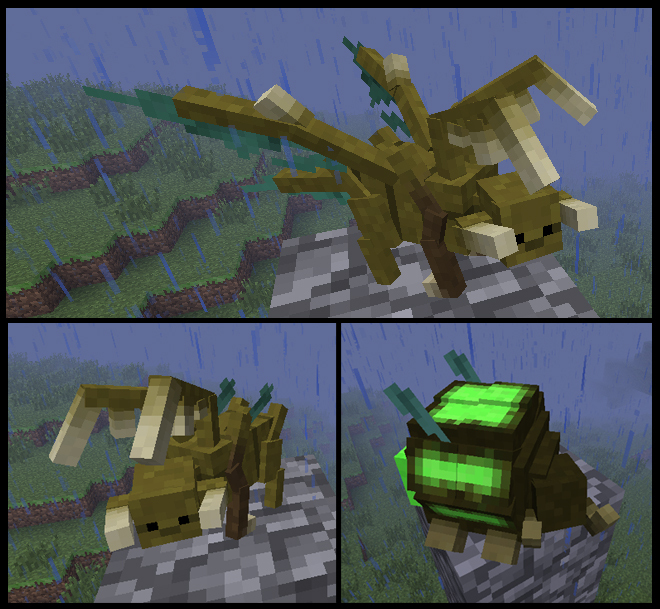 It is faster than a Creeper but has a much smaller charge and very low health. I am still coding for 1.6.4, but looking at the Forge page just now, it seems that 1.7.2 was finally finalized. If that is true, I'll download the package and being rebuilding the whole mod in that version. Hopefully the code will be cleaner and fit better "standards" in the modding community. I've been eager to update to 1.7.2. I love the new biomes.